Product code: ES7201 Categories: Sold Items, Sold Rings. 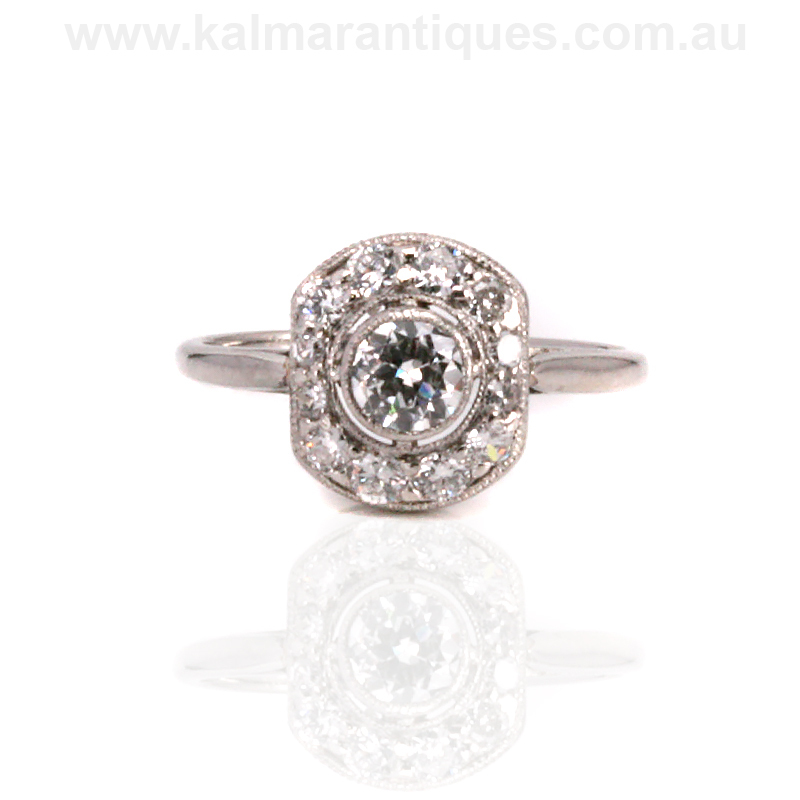 Here is a stunning 1920s Art Deco diamond engagement ring that was hand made in platinum and showcases why genuine Art Deco engagement rings have never gone out of fashion, style or demand thanks to the wonderful designs. Sitting so elegantly on the finger, this ring is set with an early brilliant cut diamond in the centre that measures 0.42 carats and is F in colour and Si in clarity and then surrounded by twelve more. However so much thought went into these additional diamonds. As they were all cut by hand and there was not the technology to cut the smaller diamonds with more facets, looking closely at the ring you will see that the diamonds actually so finely graduate in size. Near the band on each side are two single cut diamonds and then going along the top and bottom graduating larger towards the top, are four European cut diamonds on each side. These additional diamonds total 0.52 carats and sparkle so well and are F to G in colour and Vs to Si in clarity. Measuring 9.2mm wide by 10.5mm this is such an elegant and perfect example of an Art Deco diamond engagement ring whose style has lasted through the ages. Tag: 1920s Art Deco diamond engagement ring.